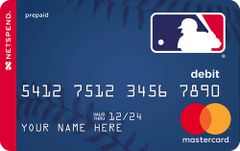 Show support for your team with your team-branded Netspend® Prepaid Mastercard® each time you use your Card. Use the Netspend Mobile App to manage your Card Account on the go and enroll to get text messages or email alerts (Message & data rates may apply). Card issued by MetaBank®, Member FDIC. Card may be used everywhere Debit Mastercard is accepted.